The Florida Tropics SC will officially kick off training camp for its third season in the Major Arena Soccer League this Sunday when they take to the pitch at Southeastern University. There is plenty new for fans to look forward this year, highlighted by the key additions of goalkeeper Hugo Silva, high-scoring forward Max Touloute and defender Jose Luis Birche, not to mention a new local rival. 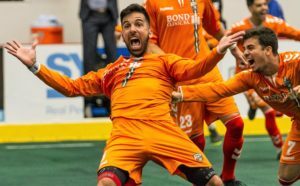 The MASL has added three new franchises this season, including the nearby Orlando SeaWolves, along with the Toronto based Mississauga Metrostars and Dallas Sidekicks. Also new is the South Central Division of the Eastern Conference, where the Tropics will reside. An expanded 24-game schedule has 20 of those games against divisional foes, including six matchups against the SeaWolves, six against the St. Louis Ambush, and four each against the Kansas City Comets and Milwaukee Wave. The regular season starts at home on Saturday, Dec. 1 at 7:05 p.m. when Florida hosts the Ambush. The first ever Seawolves vs. Tropics showdown comes at the RP Funding Center on Saturday, Dec. 29. The Tropics return the core of their lineup from last season, featuring eight of their 10 leading scorers from 2017-18, including Ricardo Diegues, captain Freddy Moojen, Victora Parrieras and Anthony Arico. Diegues set a team record in goals (28) and points (44) in his 22 games last year. Now starting his fourth season in the MASL, the popular Brazilian has 55 goals and 30 assists in just 48 games. Moojen, who has been team captain and assistant coach since the Tropics debut in 2016-17, will be starting his 12th season of professional arena soccer. In 181 career games, he has 175 goals and 81 assists following a 2017-18 campaign which saw him suit up for all 22 Florida games, scoring 22 goals and adding 12 assists. The family-friendly home scheduled features nine Saturday night starts, one Friday night game and two Sunday matinees late in the season. Saturday night game time is 7:05 p.m. The Friday home game (Dec. 14 vs. Harrisburg) starts at 7:35 p.m. and the Sunday afternoon kickoffs are at 3:05 p.m. In addition to multiple visits from divisional foes, Tropics fans will see the Harrisburg Heat and Baltimore Blast at the RP Funding Center. The other two nondivisional road games come the second weekend of the season when Florida travels to Utica and Mississauga. As always, all 24 Tropics games will be broadcast live at www.maslsoccer.com. Complete schedule information, and information on tickets, is found at www.fltropics.com, or by calling 863-240-0101.